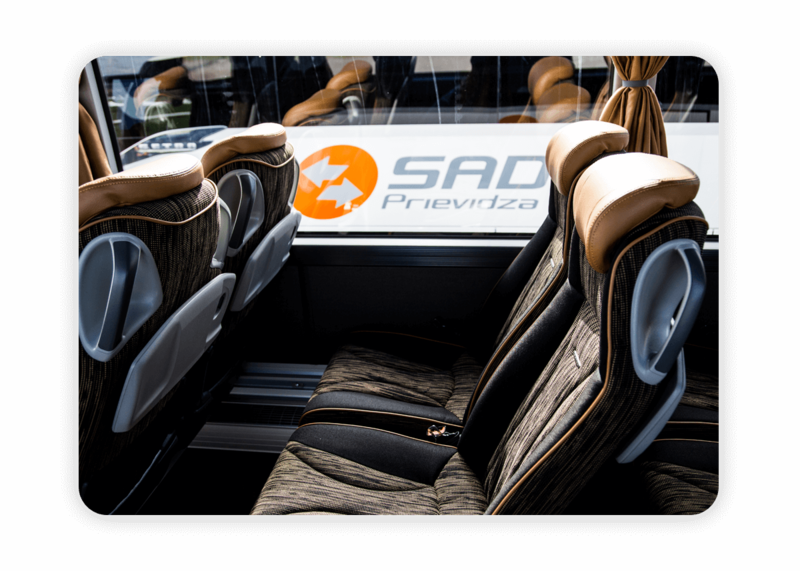 SAD Prievidza is one of the largest bus operators in Slovakia. 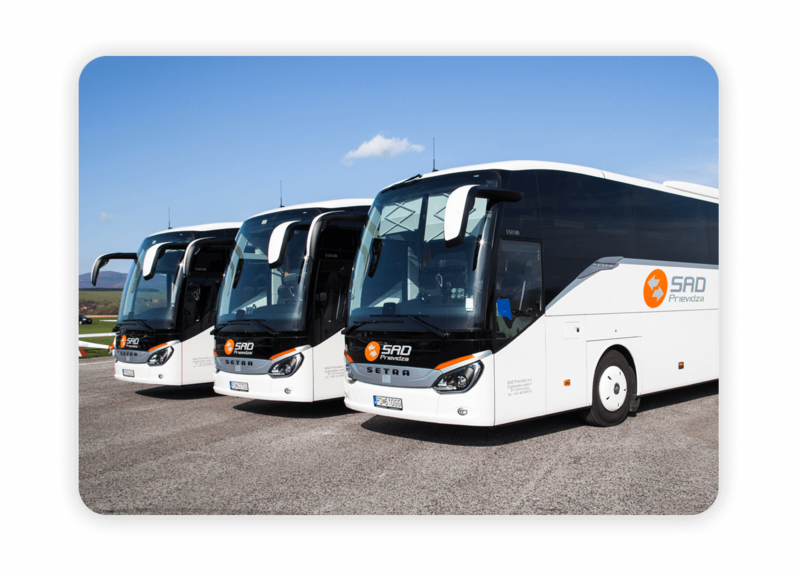 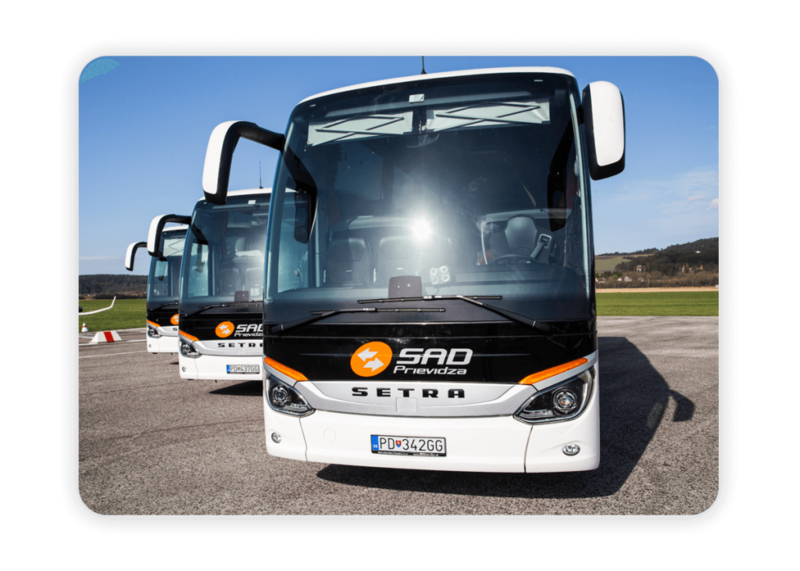 In 2017 the company expanded it’s Setra fleet with 30 new Setra ComfortClass 500 coaches. 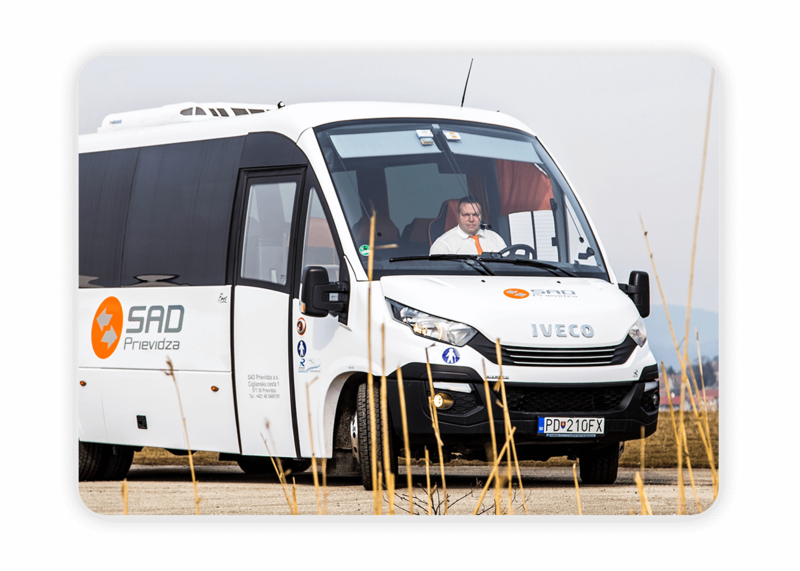 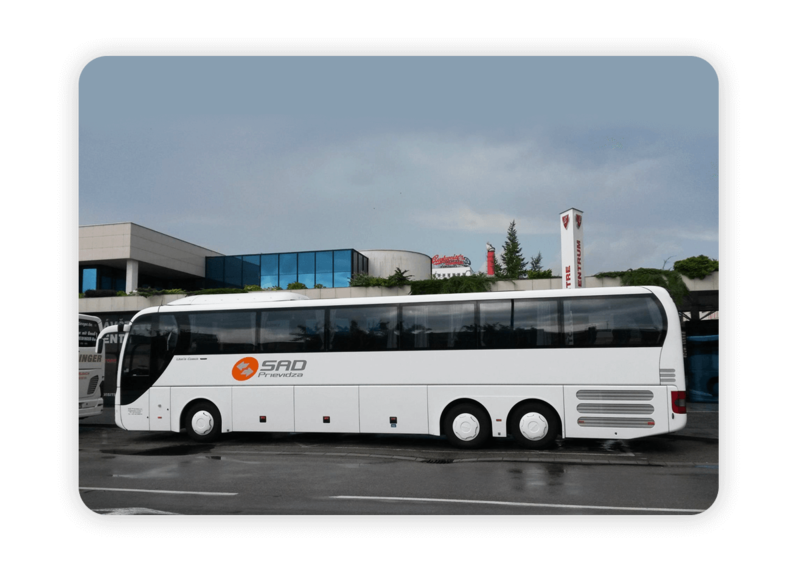 With this move SAD Prievidza became the largest Setra fleet operator in Eastern Europe. 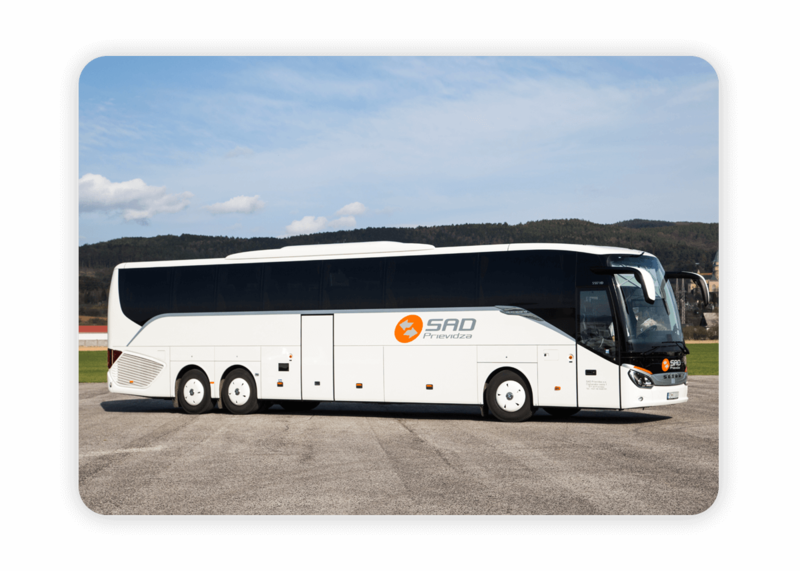 The company owns more than 280 coaches. 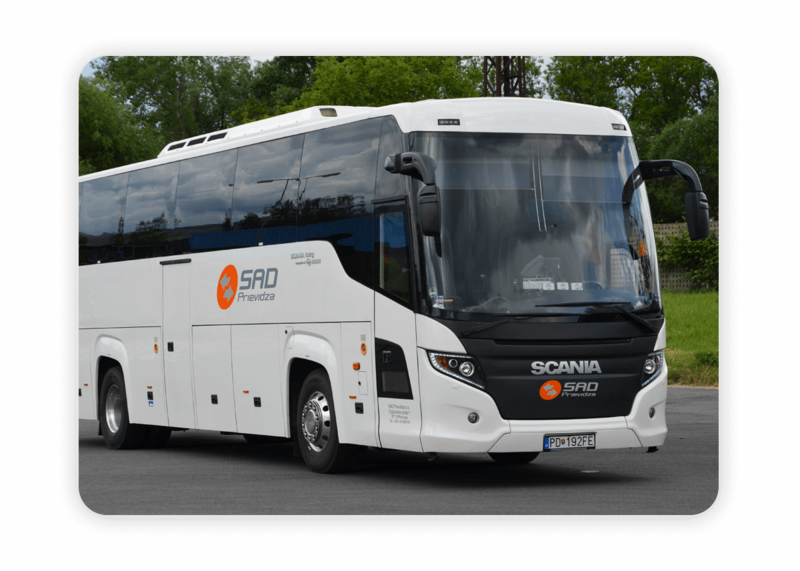 The main brands are Setra, Man, Scania and Iveco. 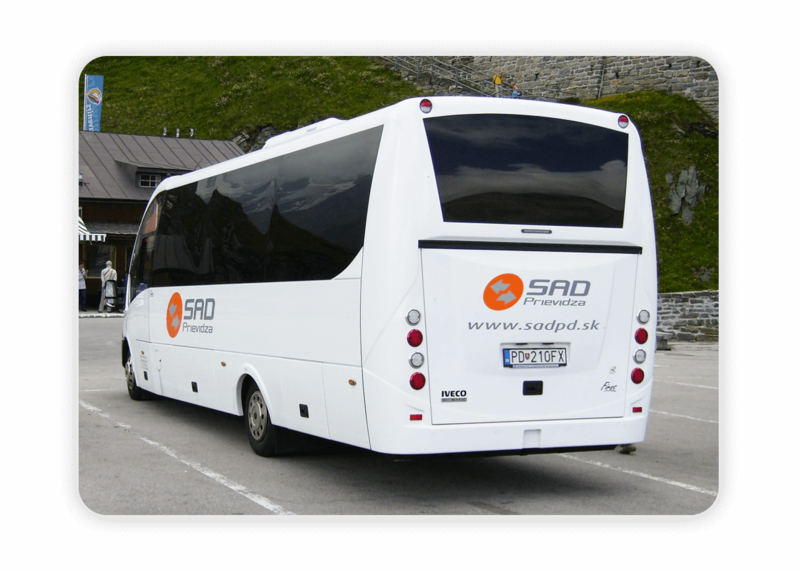 80% of the buses which are offered for hire by International Tour´s Transport department are Setra brand. 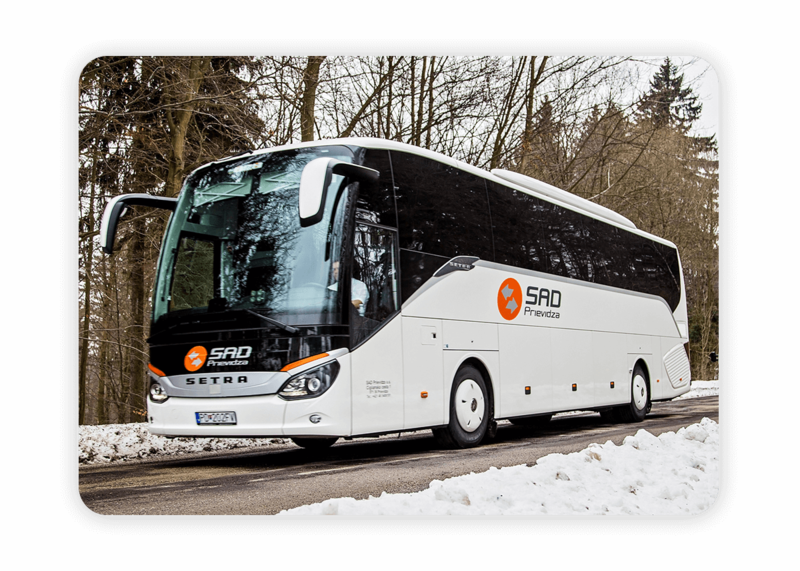 The Setra S517 HD offers comfortable travel for up to 59 passengers and also has large amounts of luggage space. 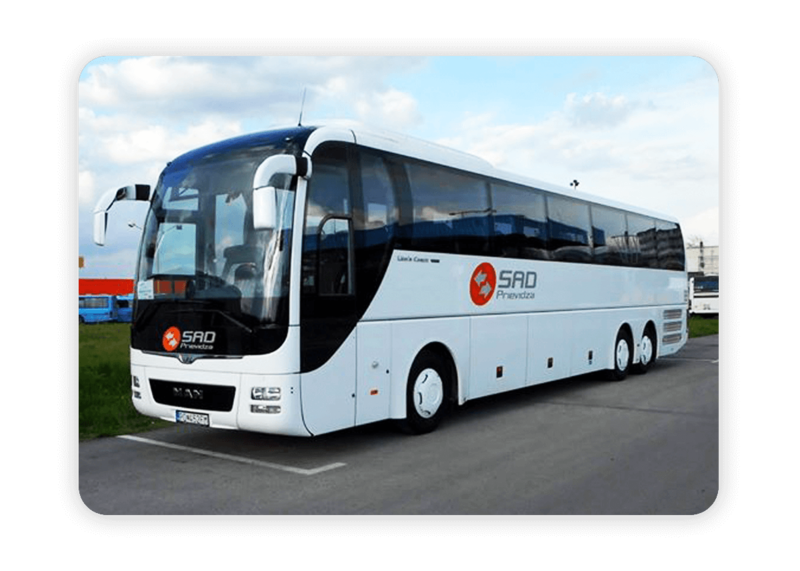 The bus belongs technically and visually to the most advanced vehicle in the current market, and offers the highest level of safety and comfort not only for the passengers but also for the chauffeur. 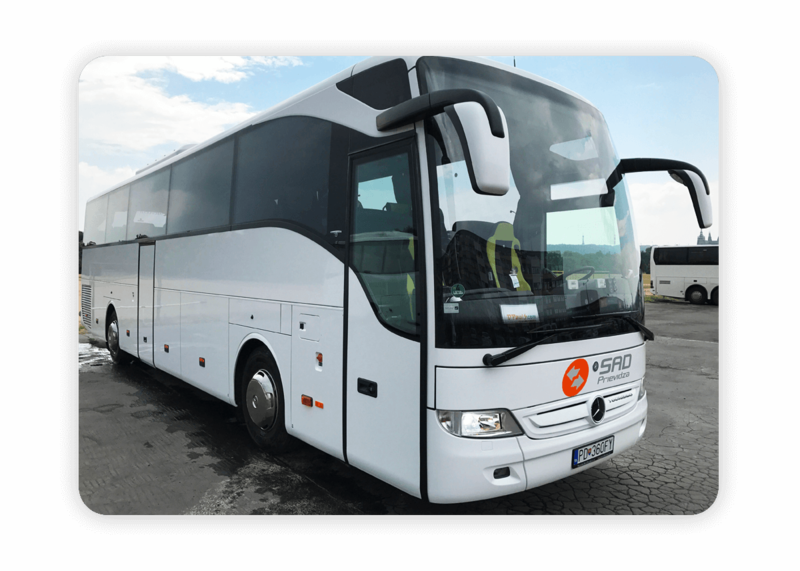 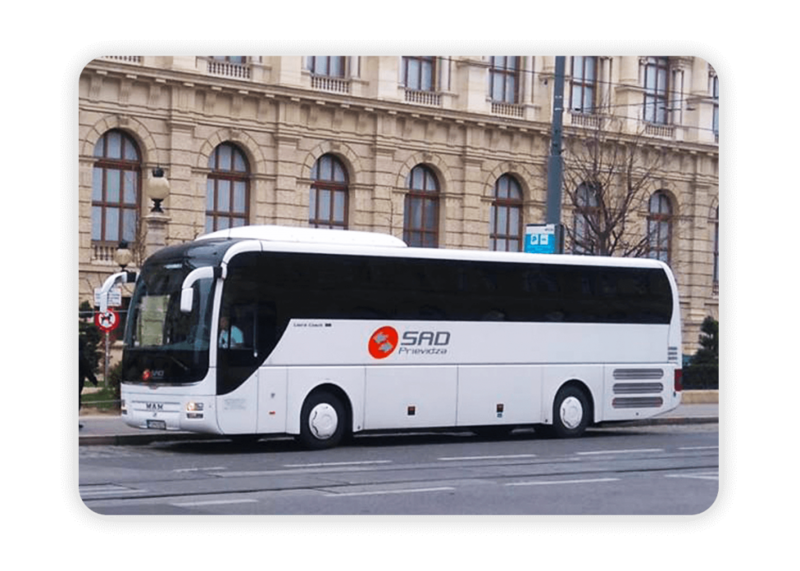 The Setra S515 HD has received the respect of many professional drivers along with the vehicle fleet management, and is also well known for having fantastic technical specifications. 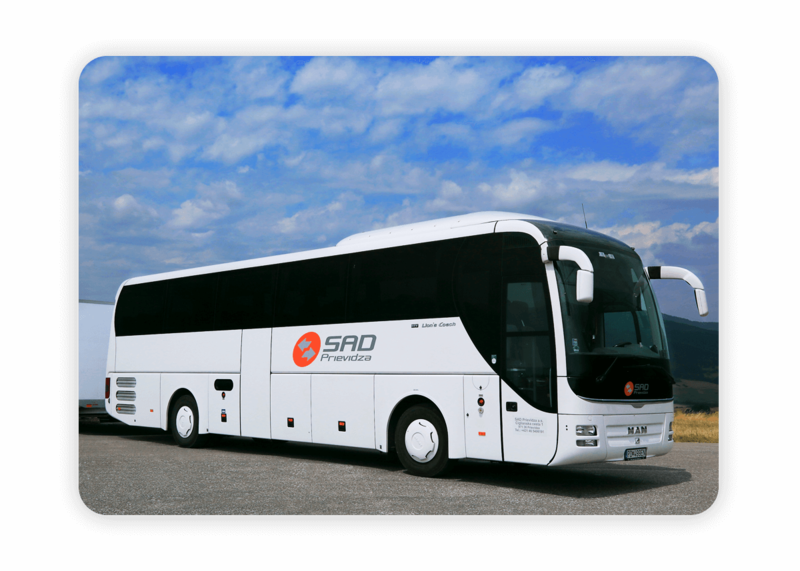 It offers comfortable travel for all with a bus height in the aisle exceeding 2 meters. 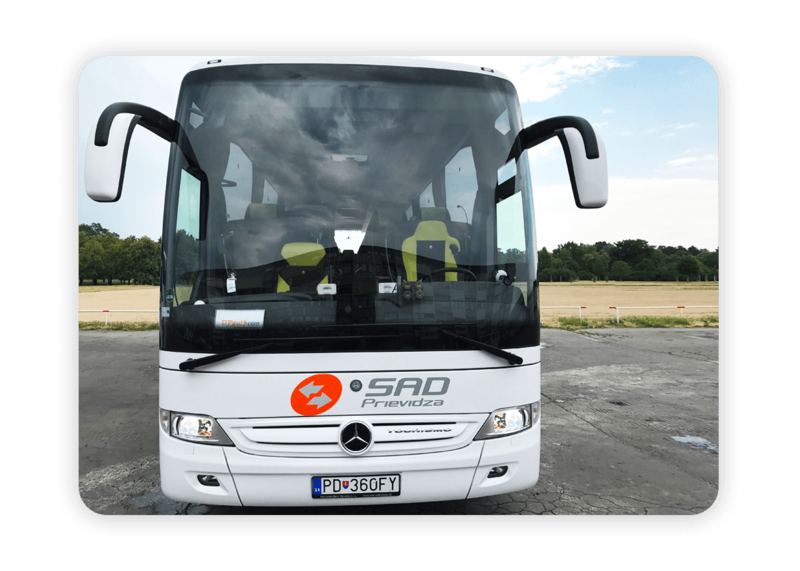 Quietness of driving and minimizing engine noise adds peace and quiet to the ride. 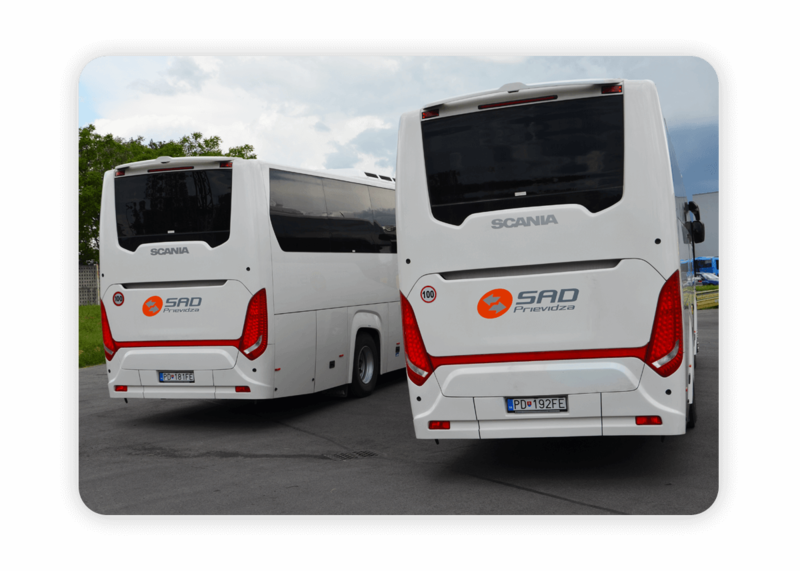 The Setra also features a collision-proof security feature that can slow down or even stop the vehicle in a dangerous situation. 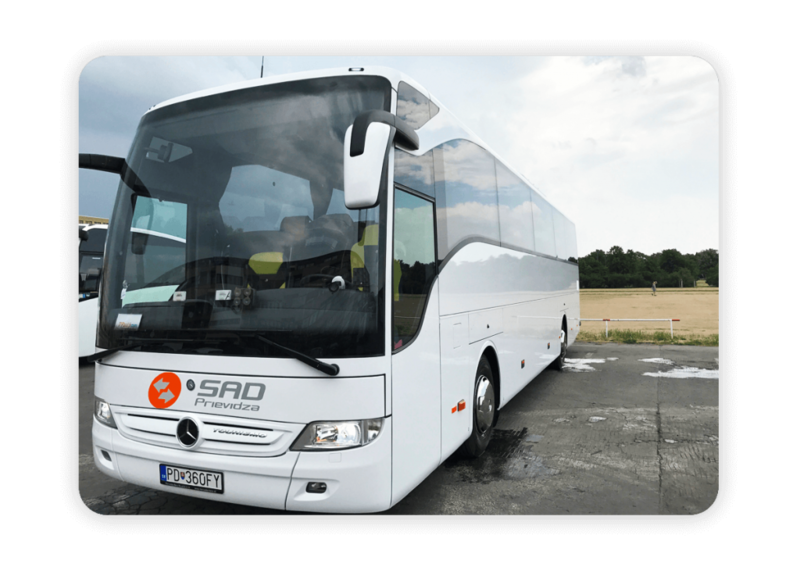 The Mercedes Tourismo RHD is Europe´s most successful high-decker touring vehicle. 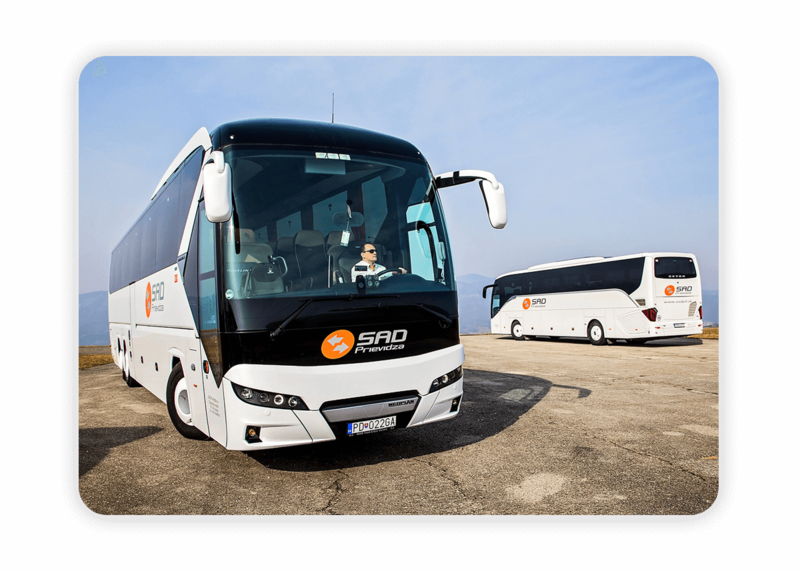 It set the standards within all travel markets by gaining their respect with the fuel efficiency, comfort and safety procedures. 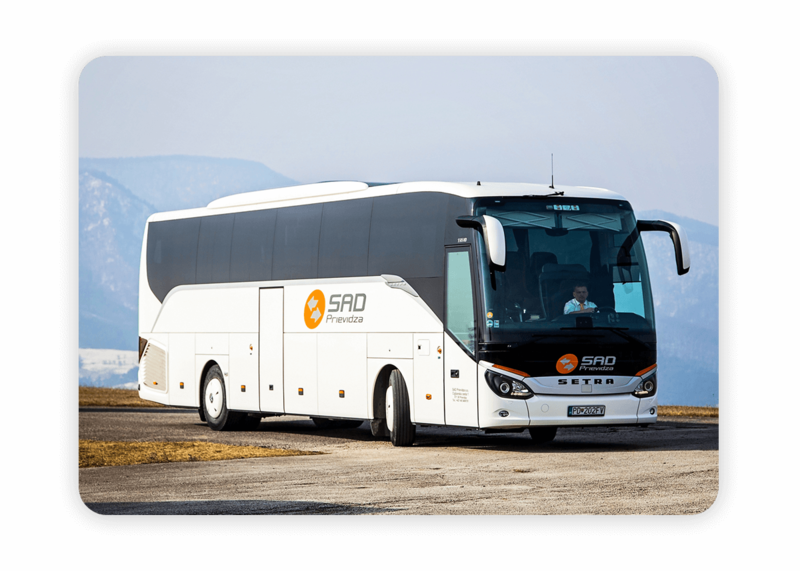 In 2017 NEOPLAN Tourliner gained the prestigious design award in the Cars / Vehicles / Motorcycles category (iF International Forum Design Award). 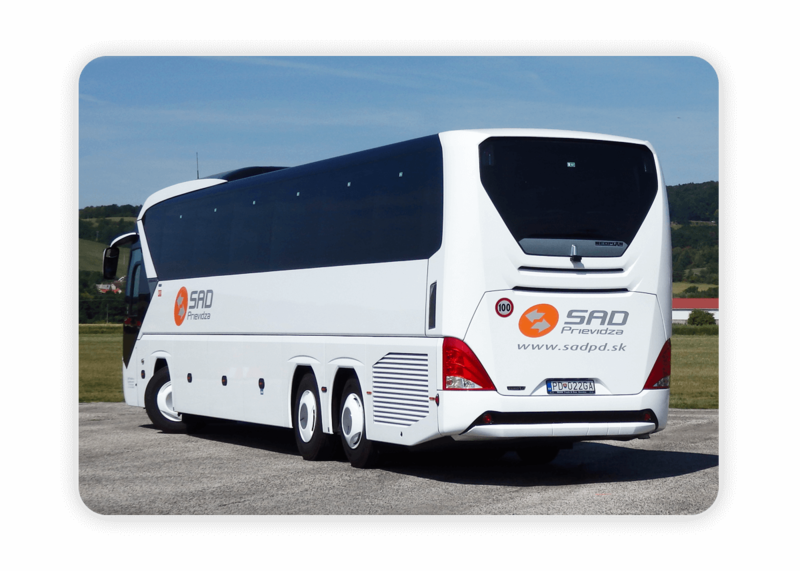 This vehicle provides first-class comfort to the driver and passengers, excellent driving performance and low fuel consumption. 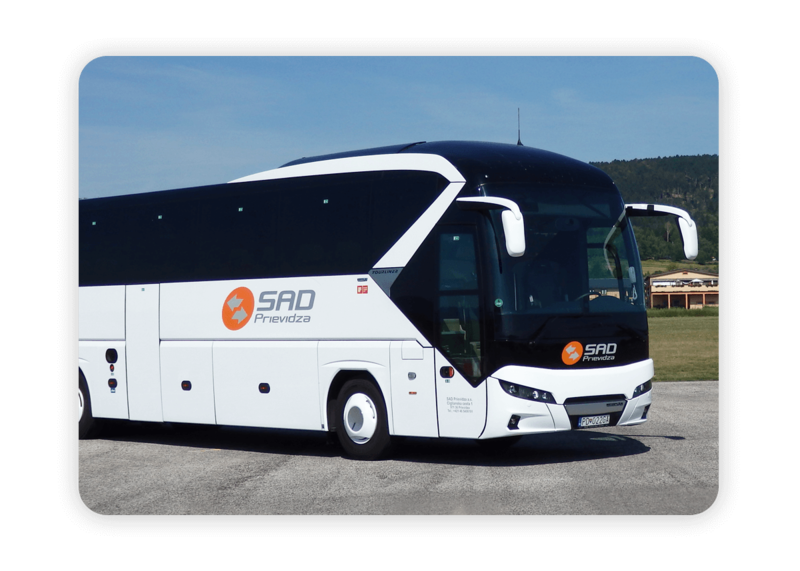 It is thanks to the engine with increased power and greater torque, the result of optimization of the entire propulsion system, but also thanks to the new exterior design, which improved the aerodynamics of the coach by over 20%. 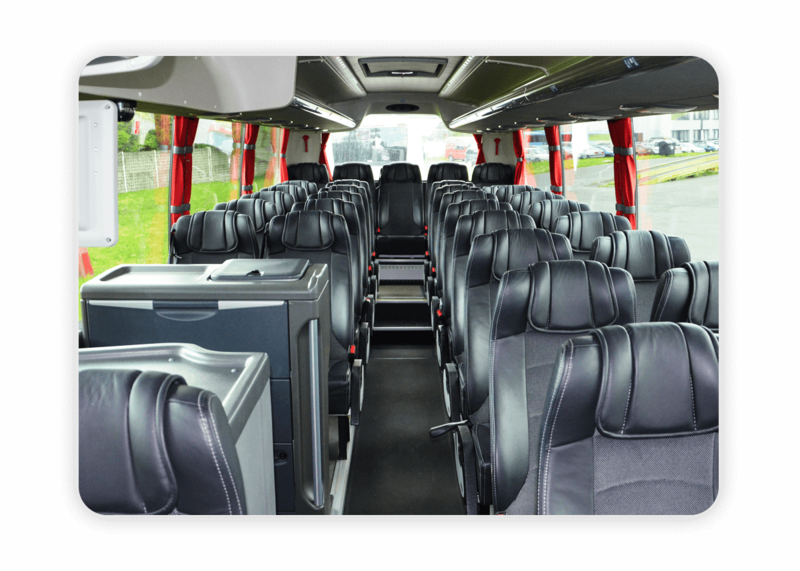 The Man Lion’s Couch is a classic tour bus suitable for a wide range of tourism applications. 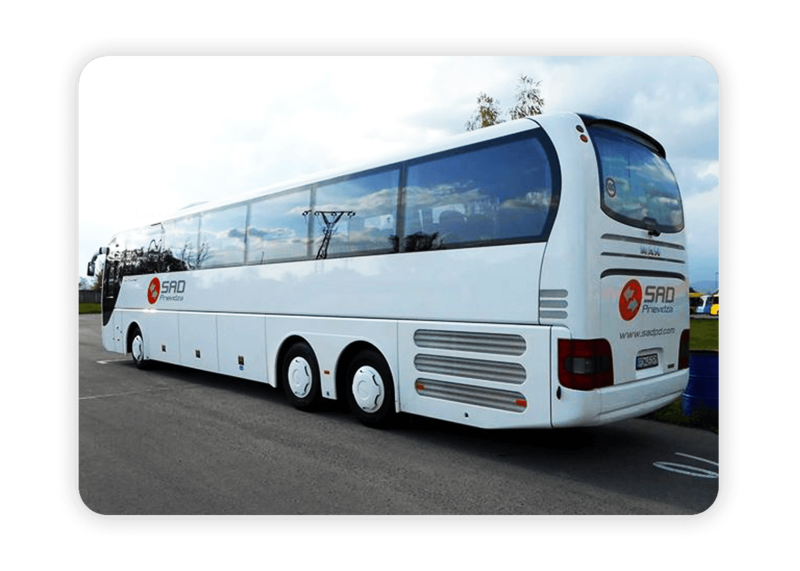 The volume of the luggage compartment is up to 9,40m3, which is particularly appreciated by passengers with a large amount of luggage. 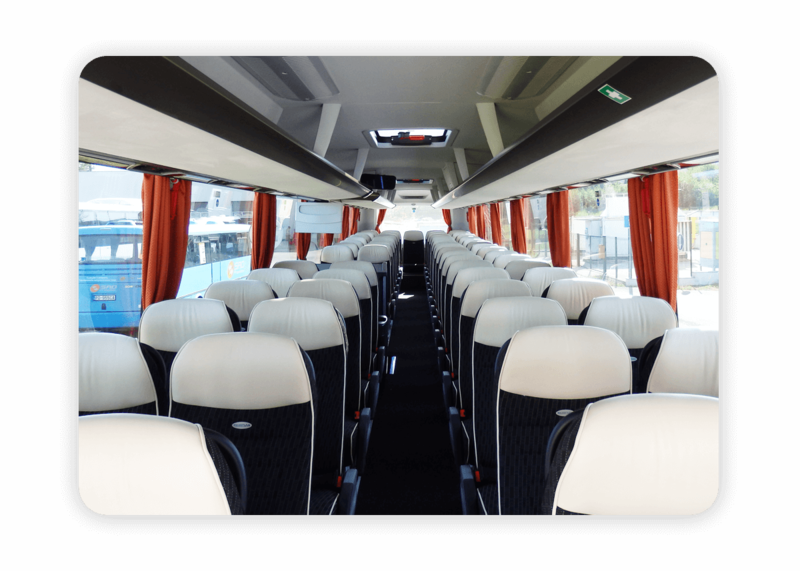 Passengers also have at their disposal spacious storage areas, folding tables, service kits with reading lamps and adjustable fans. 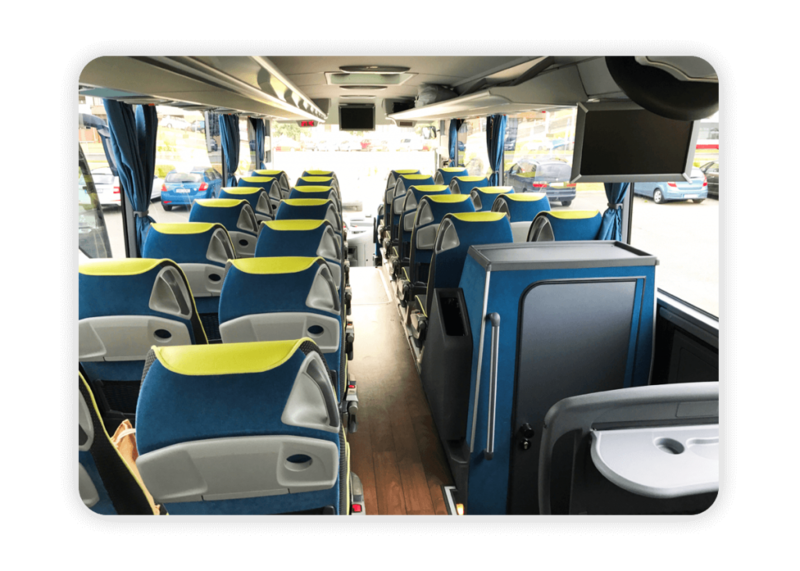 Passengers can watch movies on two 23″ monitors, one in front and other in the center of the vehicle. 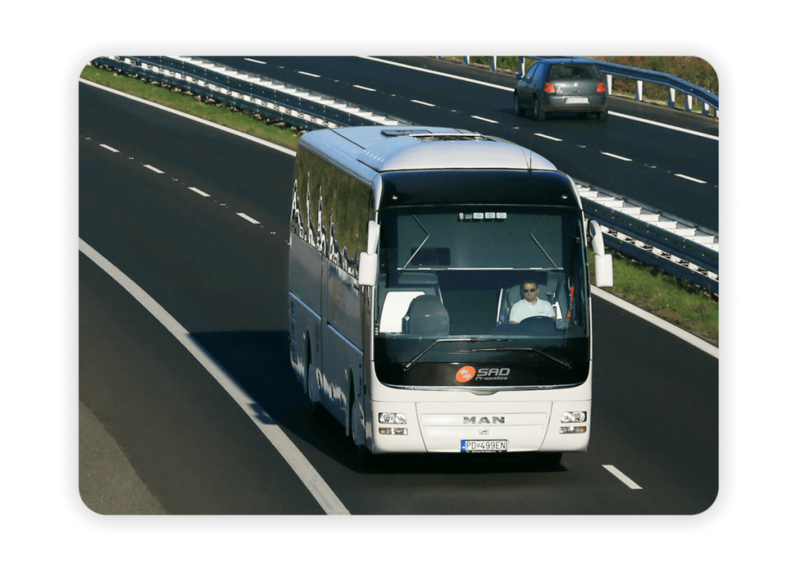 Man Lion’s Coach is an efficient long-distance bus that radiates power and performance while still driving on a sustainable and sustainable journey. Passengers and drivers appreciate mainly the comfort of the coach and the safety of the means of transport. 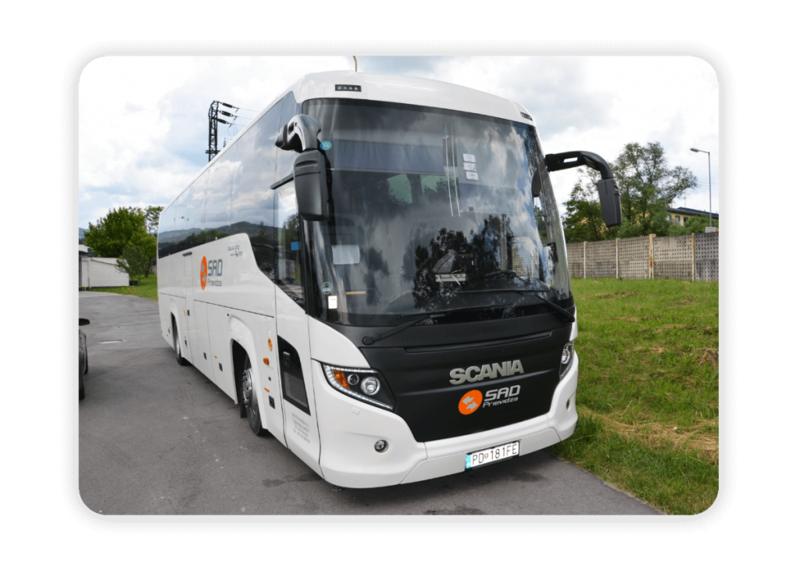 Scania Touring, with its distinctive style and reliable performance is destined to be a reliable means of transport for the needs of both long-distance, contractual and shuttle services. 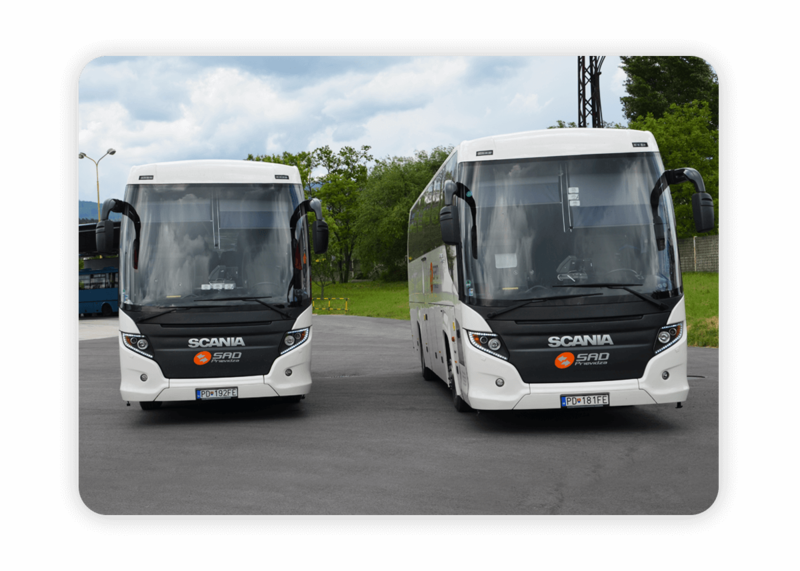 It does not matter whether it’s too cold, rainy, hot or windy, Scania Touring provides a shelter on every road. 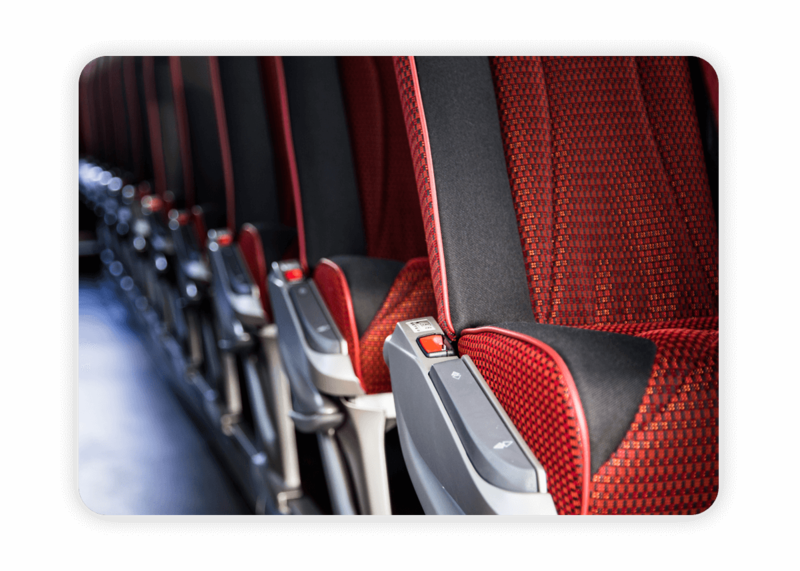 Passengers welcome first-class interior design, excellent insulation and air conditioning in all weather conditions. 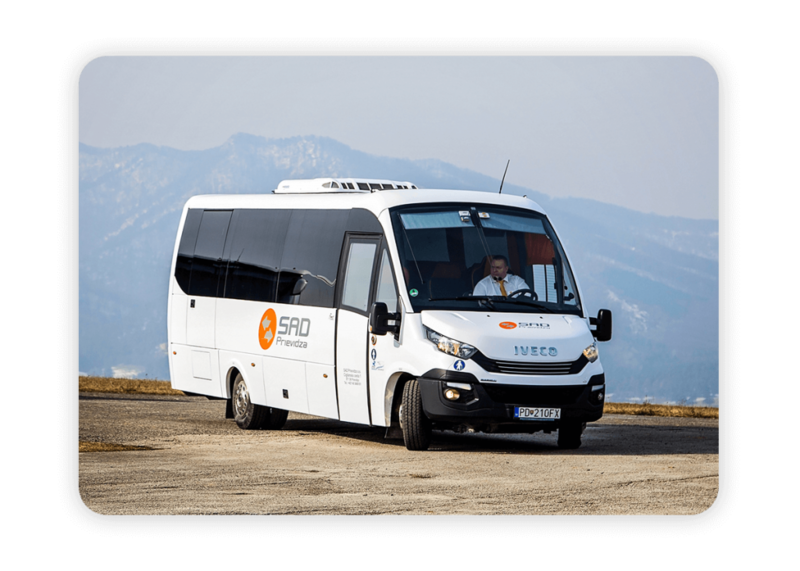 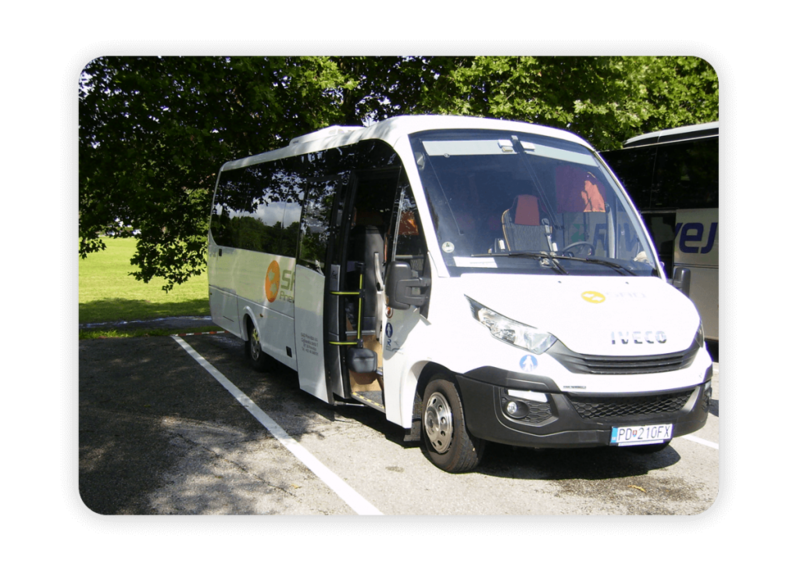 Iveco First FLHI is an excellent way to transport a smaller group of people to their chosen locations, whether on holiday destinations or sports or cultural events. 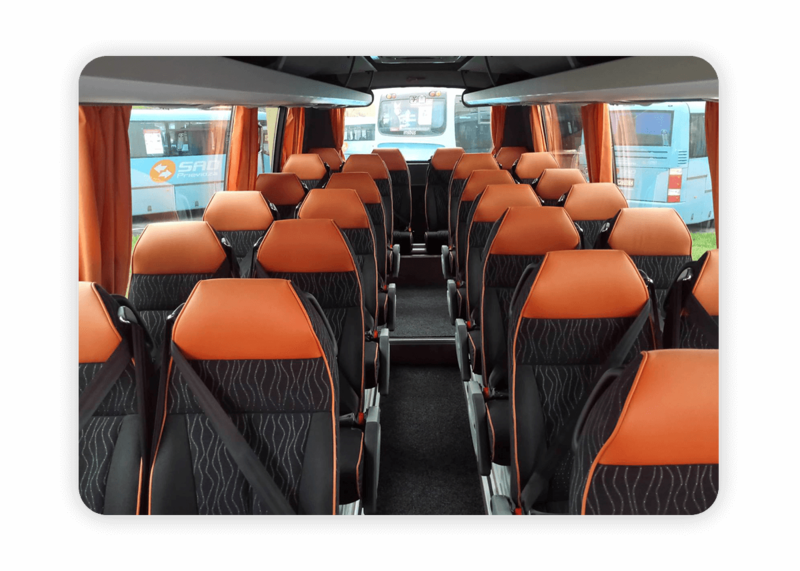 Especially interesting is the design and interior solution of the bus. 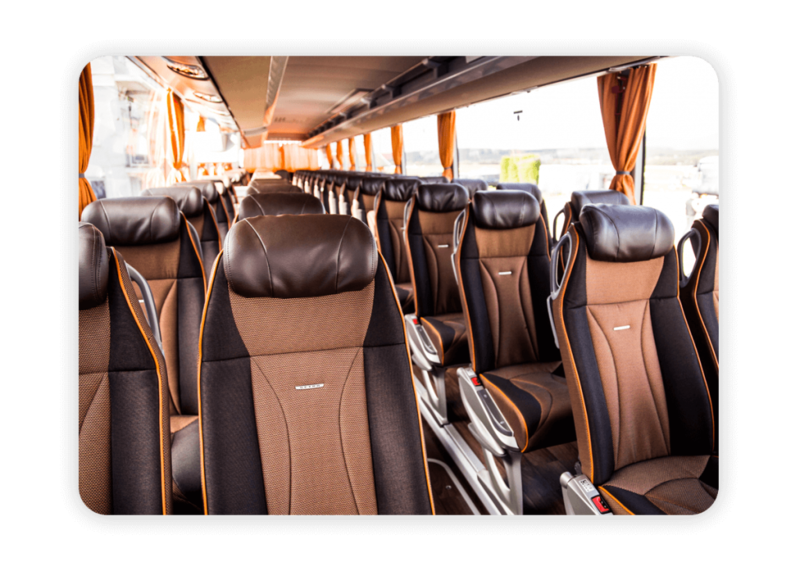 When designing the interior, emphasis was placed on the arrangement of the seats in order to ensure the comfort each passenger. 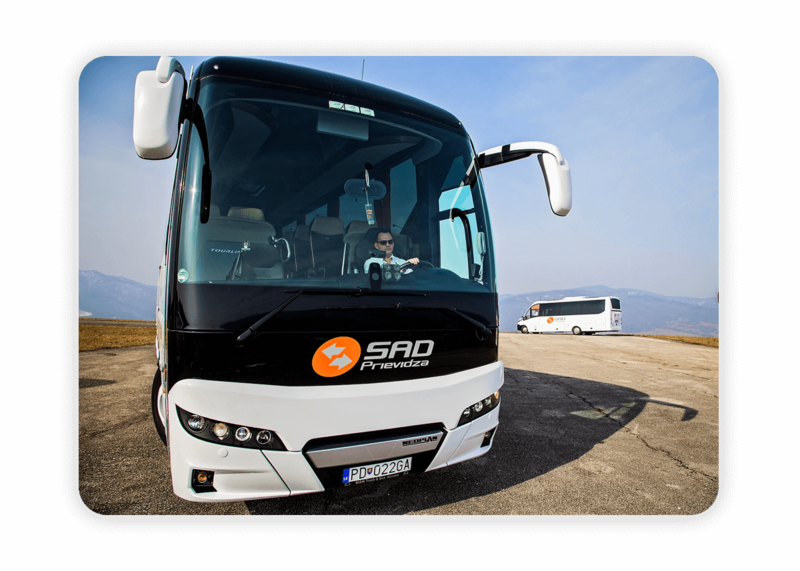 SAD Prievidza JLC met the needs of constantly increasing number of cyclists in the region. 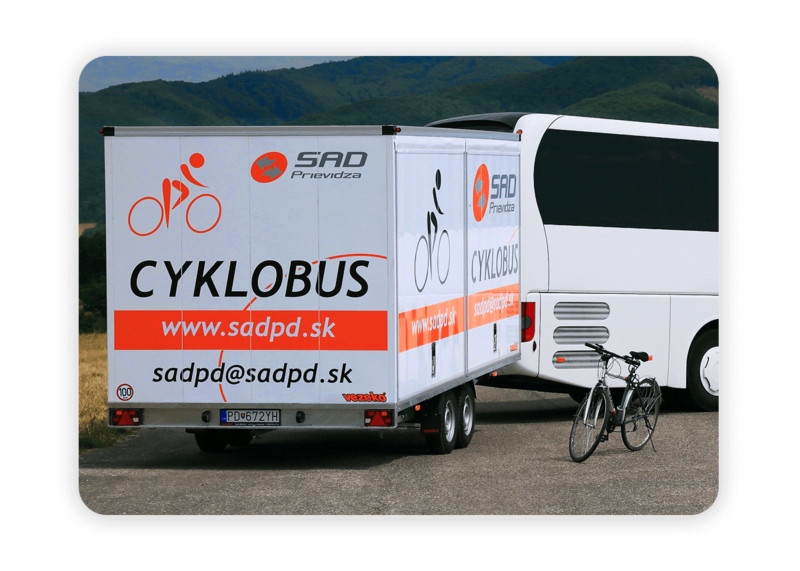 The production of the cyclobus trailer was commissioned by the specialized company VEZEKO. 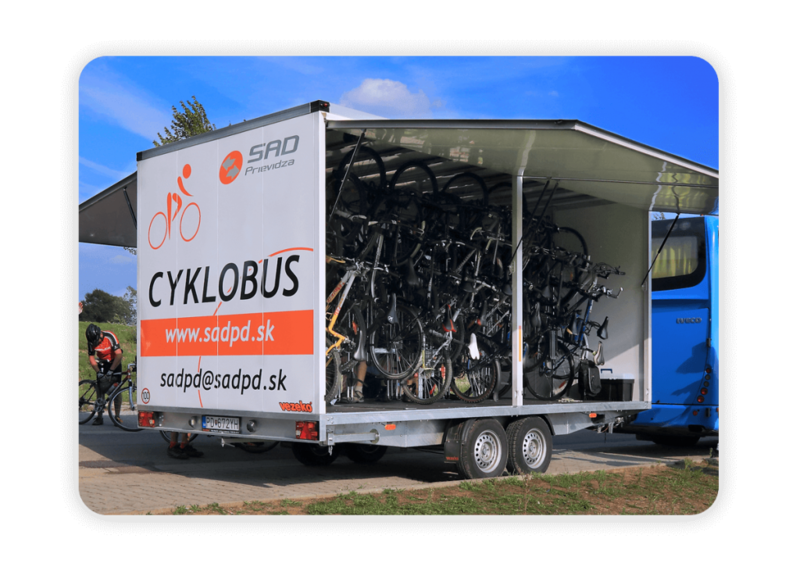 VEZEKO designed the trailer in accordace to secure the safety of the bicycles during transportation by using special Thule bicycle holders. 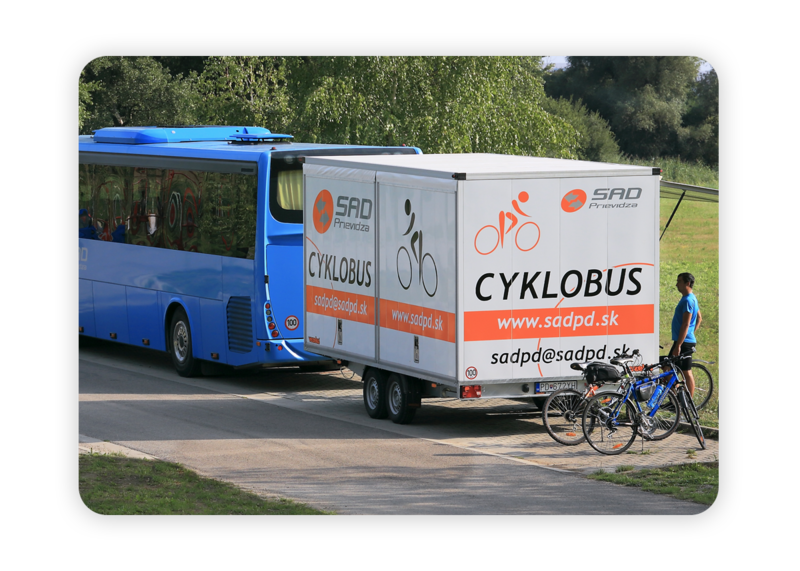 The trailer keeps bicycle locked inside as well during the parking time to avoid any type of thievery.